The Rivermouth Action Group Inc Home Pages for many groups. Anyone who believes exponential growth can go on forever in a finite world is either a madman, an economist or just a politician. Over ten years of complaints to Brisbane City Council and nothing has been acheived and vehicles still continue crossing double white lines to enter shop driveway. 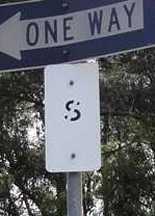 Which way should "No Stopping" signs face? Should there be any paint or message on them? 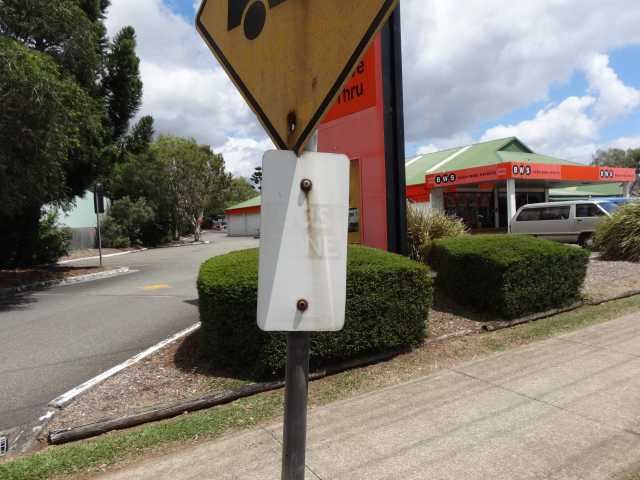 In the Moreton Bay Regional Council area many "No Stopping" signs which face across the road and not towards oncoming traffic. On both State controlled road and Local Government roads. 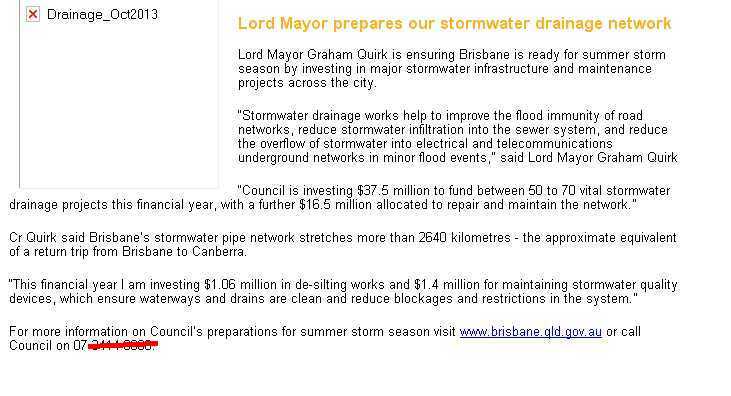 and culverts in the Lytton / Lindum / Hemmant, Wynnum West areas of Brisbane. How long has there been complaints about blocked drainage in the Hemmant and Lindum areas? Check out The Brisbane Courier of 23 April 1928 "Letters to the Editor" on page 3. Sir,-The whole countryside at Hemmant and Lindum is under water this morning. The fault lies with the mouths of existing old drains having been filled up by the river dredges with silt pumped on the banks. The population around here have approached the City Council time after time to have this evil remedied. Letters also have been written, and the Progress Association has made efforts, but all of no avail. The situation becomes worse every time it rains, and has reached a point now where some drastic action seems necessary at once. We are paying higher rates, values have been increased, and there is no doubt about it, we are getting practically no local attention worth mentioning. After all, the local bodies were more competent to deal with local affairs than this unwieldy Greater Brisbane machine which has been set up, and seems to be unworkable, to handle minor affairs, no matter how urgent they are. As drainage is the first principle of health, and we have set up a Health Board, with a mosquito department and other bodies, it would seem that some practical action would be taken on these lines, especially when several approaches have been made to the authorities in that direction. However, the inactivity of a body set up to look after public health and comfort is amazing. If the Greater, Brisbane scheme is to have public approval and confidence, different lines of action will be absolutely necessary to prove their .worth, and merit their existence. So .far, .the public around here is sadly disappointed with- their efforts and results, and has cause to be. We have no-individual right to act, and w" cannot personally go and remedy the drainage evil, under threat of legal action, and collectively, though many efforts were made, and are still being made, we seem to be also powerless. This state of affairs is very serious. We cannot remedy the evil ourselves, and the body set up to remedy it will not act. We really pay for service, but are refused the service we pay for. We cannot clear out and leave our places, where we have toiled and spent our money in improvements. The old settlers here had a drainage board. They had drains dug, and floodgates put in, and we, the advanced generation, allowed them to collapse, and we allow further that the Harbour Board can bank up all the possible means of water escape with silt out of the river, and we look on powerless. We see our cultivations flooded, knowing that the neglect of duty of the authorities we set up are responsible for the damage, yet we are seemingly powerless to act. What is wrong here? Someone must rise up and move; some final effort must be made to improve the position. Drainage is the first principle of health and comfort, and it is the council's bounden duty to see to it. Just one example. The next two photos are of the same culvert. 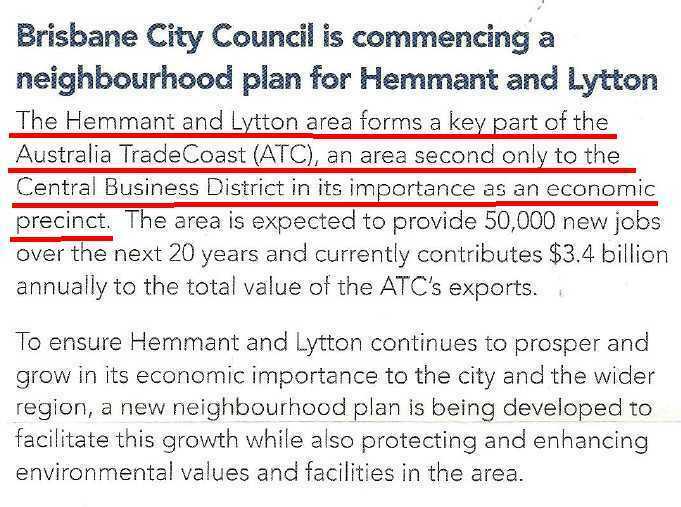 How important is Lytton and Hemmant to Brisbane's economic future? Below is photo of Hemmant Creek, Hemmant. Notice the four box culverts. 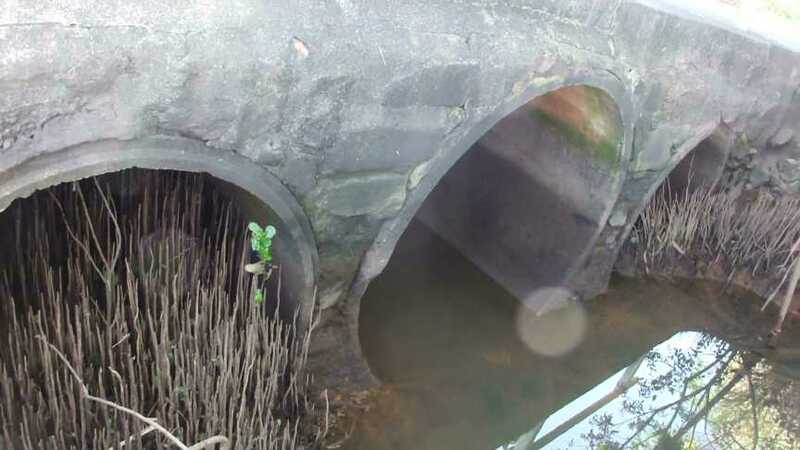 Then Hemmant Creek then tries to flow out through the three pipe culverts in photo below. tidal gate that doesn't even hold back incoming tides. Don't wonder any more why residents at Hemmant suffer unnecessary flooding. 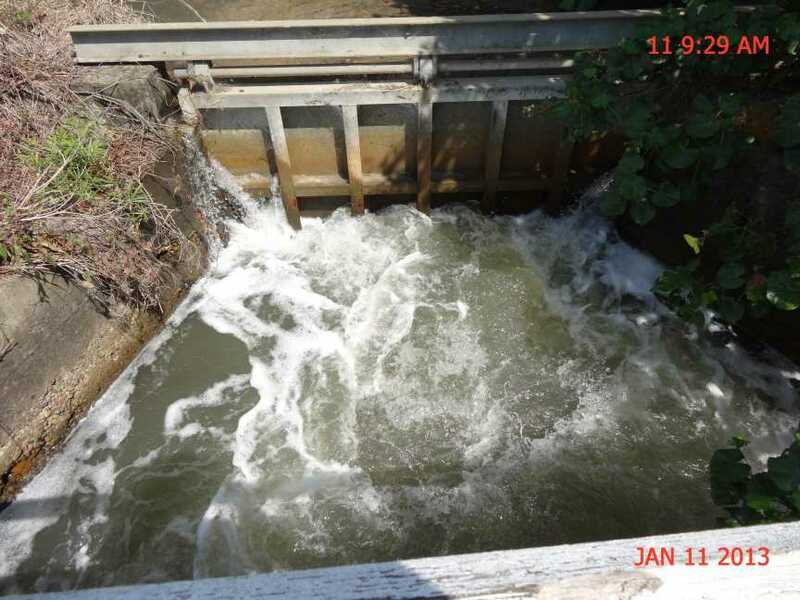 Hemmant Creek's tidal gate does it hold back flood waters. This site covers Hemmant Creek. Main Drain, Lindum Creek, Channel 4 and Iona Drain. you need to read this web site to find out why and just who is irresponsible and why. Rates' Money for signs but little for drainage. Lindum Creek just after it was cleaned out. The gully along Lindum Creek was filled in for acess and fill not removed. 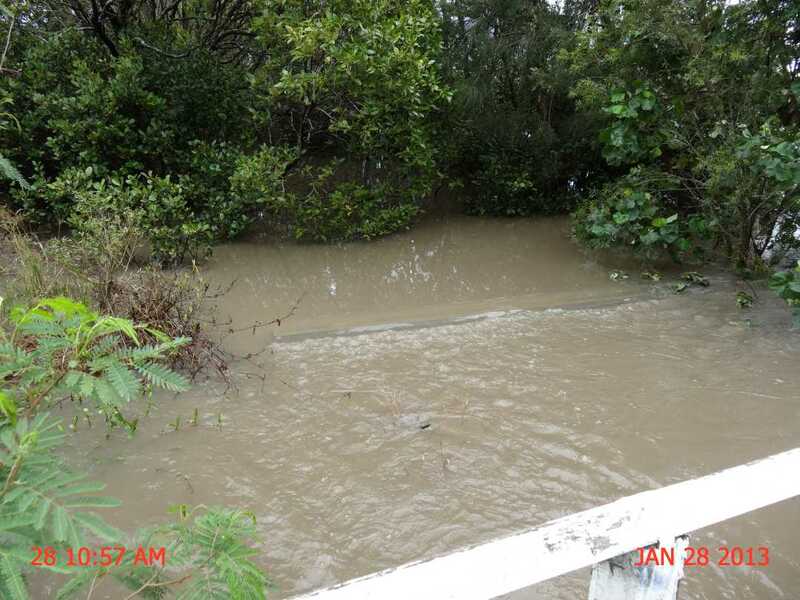 The flood water just opened the blocked drain and washed the fill into Lindum Creek. 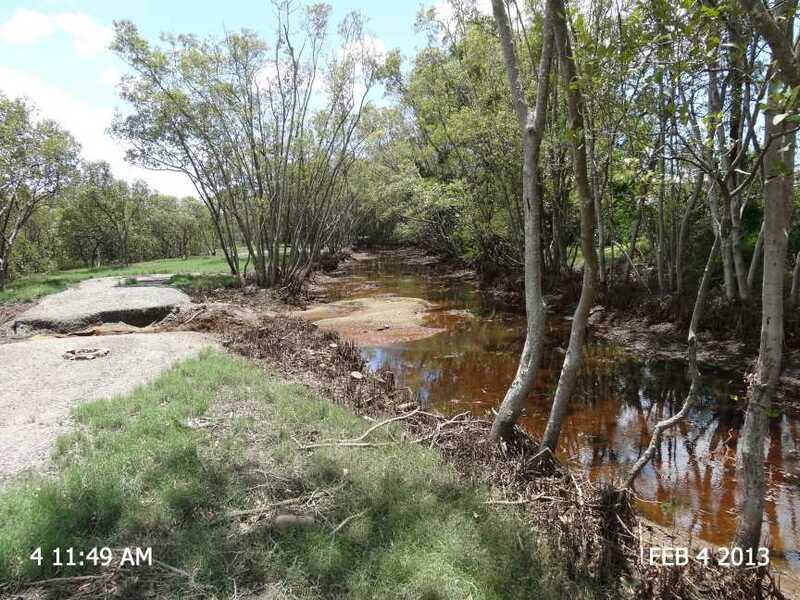 It's time for the BCC to start again but this time reinstate all the blocked off drainage channels and culverts that allowed drainage into Lindum Creek. Blue Care's development at Richmond Road Carina Queensland is non-compliant with the conditions imposed by the Planning and Environment Court of Queensland. The Brisbane City Council appears reluctant to enforce those conditions. What did Kevin Rudd and Wayne Swan promise to do about Aircraft Noise on 25 February 1996? Watch and listen to the 2 short videos of their speeches to concerned voters. Main Road are responsible for road side signage maintenance along most state controlled roads this does not mean it happens. Being an equal opportunity employer it appears that limited sighted employee are employed to watch out of faded signage and pot holes. The Australian Public have been subjected to a Airservices Australia HOAX Policy for more that 15 years in their attempt to artificially reduce reported noisy aircraft across Australia. 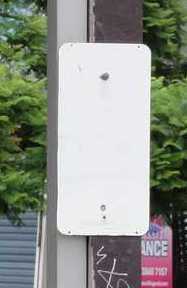 devices, so that road users can readily anticipate the course of action required. consequently creates a potentially hazardous situation. 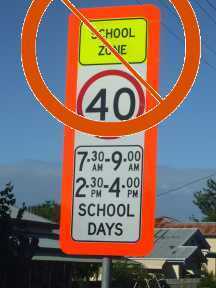 The Bligh Labor Government announced the upgrade of all school speed zone signs with a mainly uniform times of operation across the state. 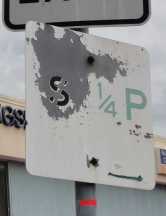 Driving in Brisbane has its pitfalls as traffic signage is not maintained. Brisbane City Council can afford expensive legal council to prosecute you if you park on unsigned section of Brisbane's streets. 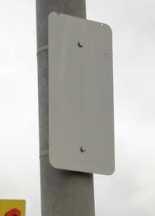 If you see or know where there are faded or unreadable traffic signs please email me. Email address is near the bottom of every web page. Do you travel in T2 lanes in Brisbane when you should not? Do you always read the signs? Sunset on June 7 until June 12 in 2010 was 5.00 pm. Times of operation is 4.00 pm to 7.00 pm. 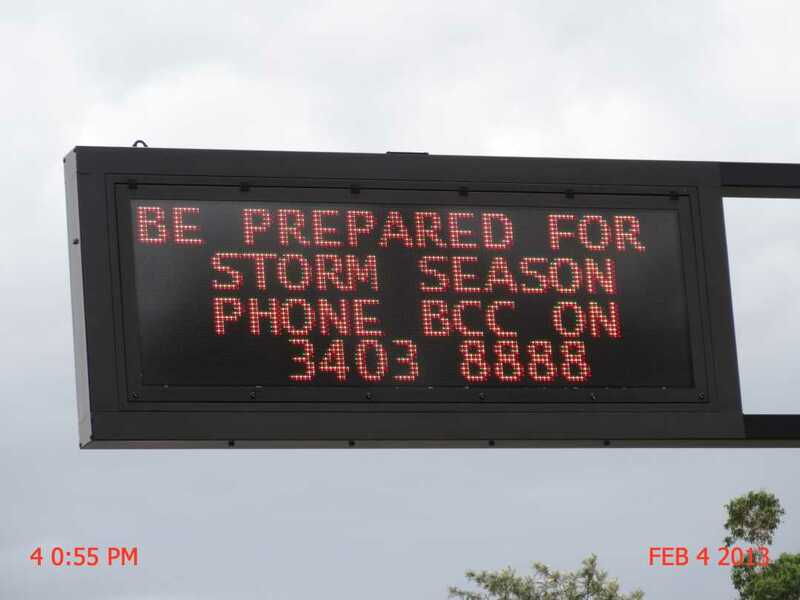 Could you read this sign after sunset with low beam headlights as the times are 2.5 m above the road surface..
What does Queensland Transport literature have to say about placement of traffic signage? Yes I know that there is a mistake in the quote above but you will notice the quotation marks as that is the exact wording in the document. Is this just good enough? 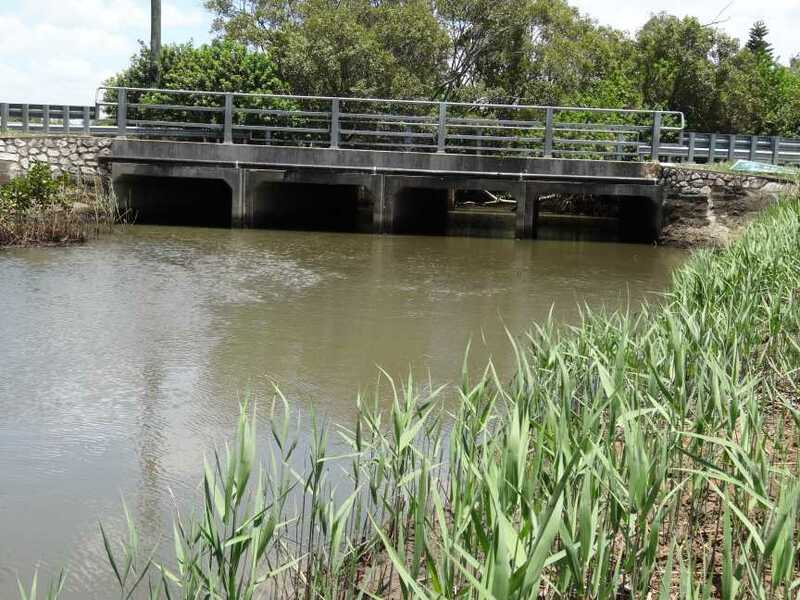 The Queensland Government's 'Solution to Pollution is Dilution'. South East Queensland's human kidneys. 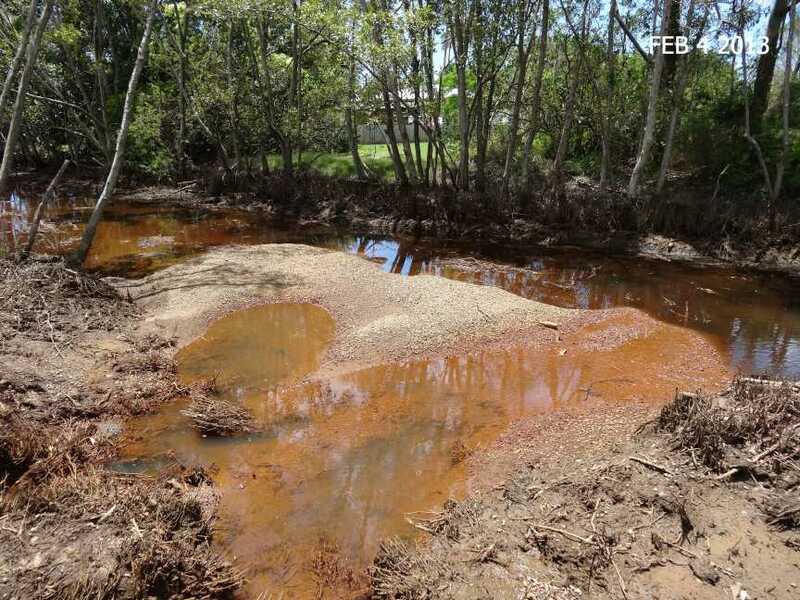 Do you really want poison added to Queensland Drinking Water? READ this web site now and write to your Politician today. The results from chronic fluoride poising during tooth formation called Dental Fluorisis from groundwater in China containing 4 to 9 ppm fluoride. School Uniforms now part of the Act just not the Regulations. don't expect the Director General of Education Queensland to be of any help. The Director General can't even decide on shoelace compliance. 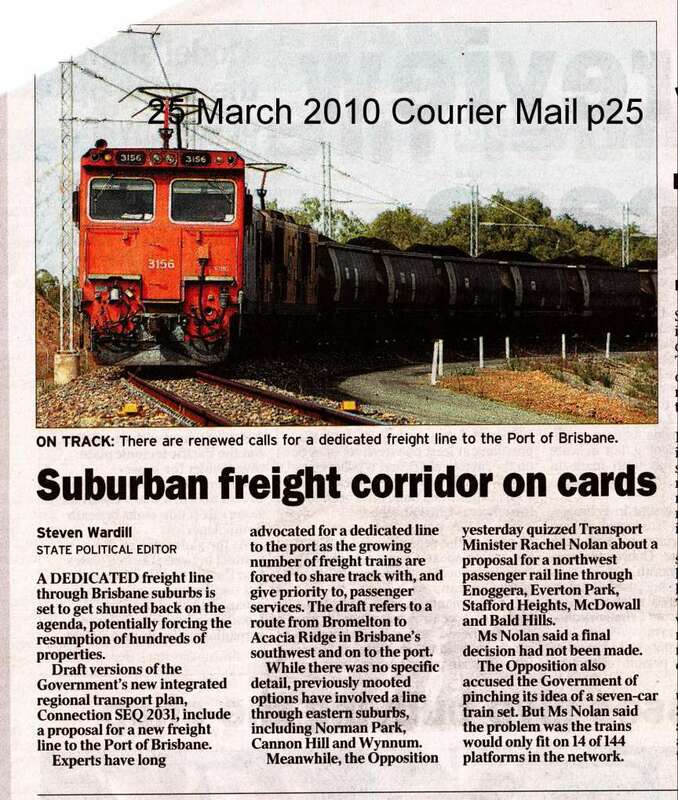 BEWARE Second Dual Gauge Freight Line is planned to access Fisherman Islands Port through Brisbane's Eastern and Southern Suburbs. When the existing Dual Gauge Rail Line was built in most cases only back yards were resumed thus the noise from the freight trains was even closer to residential homes. We expect that the second Dual Gauge Rail Line will require the resumption of most residential properties on the northern / western side of the existing Dual Gauge Line from Acacia Ridge through to Wynnum North. They have no publicly available Public Consultation Policy Document. So we can tell when they are not following policy. What is wrong with ENERGEX present consultation? and you most probably have no chance in changing their decision. We have a copy of the Queensland Labor Government Policy Document on Consultation. Please e-mail us requests for a .pdf copy. As Øystein Dahle, former Exxon vice president for Norway and the North Sea, observes, "Socialism collapsed because it did not allow prices to tell the economic truth. Capitalism may collapse because it does not allow prices to tell the ecological truth." Energex decided before any consultation with local residents to place a new 33/110 kv power line near residents at Wynnum North on Brisbane's East. The new power line is to supply the Port of Brisbane at Fisherman Island. On Monday 3 Feb 2003 The Civic Cabinet of the Brisbane City Council (Queensland Labor Party) approved a submission to build a new golf course and 160 houses on BCC sport and recreation land at Cannon Hill. This land adjoins Conservation Zoned land which is inhabited by Australia most dense colony of Squirrel Glider Possums. The land on which the Golf Course is proposed is mainly a Conservation Grade Wetland / Flood Plain and much of the remaining land is covered by tree canopy and is prime Squirrel Glider land. Many trees will be lost and any replanted trees will need to be at least 200 years old to produce hollows which provide homes for Squirrel Glider Possums. Just how slack is the Queensland's E.P.A.? then who is making all these STUPID decisions??? Fisherman Islands to Melbourne Rail Line REPORT. You must check this site out. Does Queensland Rail want to build a new rail line through your back yard, through your local bushland, through some significant state forest? Rod Welford reneging on 1998 Promise to set up an Urgent Review Committee on Land Valuations in Queensland. Promise for an Urgent Review never happened. Now he is no longer the Natural Resources Minister and now not even in Parliament. Just goes to prove this is one politician and his promises you can't depend on. We now have a new Minister and the same promise!! An Assessment of Environmental Impacts and Risk Factors. A must READ last two pages on air quality for Brisbane & S/E Qld Residents. the book is now available on this web site. A must READ for any new community/environmental group starting out. Does the Brisbane City Council watch this web site? If so, are they concerned? Complements of developers and BCC / Planners. The Rivermouth Action Group Inc.
Ban Aircraft over Residential Brisbane B.A.R.B. This page links to most Pollution pictures sites on RAG site. Register your very noisy site in Brisbane in our data base being developed. List of Contacts for Local Groups.